I'm not sure what we called this toy, but the box says it is a "Miracle Wheel". I know we didn't call it that. 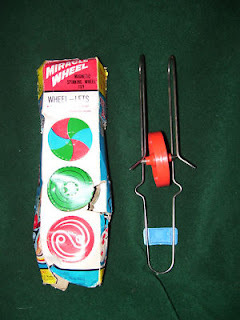 With a flick of the wrist you could make the wheel travel along the wire frame and defy gravity. It was my brother's. Posted by Karen at 8:09 p.m. I'm not sure what we called it but the company sent it as a guesture of good sent it to my son after he returned the "Sea Monkeys" he had bought from the advertisment on the back of a comic. It was his first act of consumer protest.